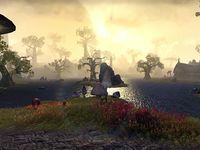 Lake Hlaalu is a lake in southwestern Morrowind, in the western part of the Deshaan region. The city of Narsis, capital of House Hlaalu, is situated on its southern banks. It is named for the Great House Hlaalu. This page was last modified on 9 June 2017, at 21:42.